Cavan 1-5 Mayo 4-3 (Breffni Park, 6/2/1955). MAYO: M Corkery; S Downes, P Prendergast, S Flanagan; W Casey, J McAndrew, E Moriarity; P Irwin (0-2), G Keyes; P Solan, D O’Neill (1-1), T Coleman; M Flanagan (2-0), T Langan, J Nealon (1-0). Westmeath 1-5 Mayo 2-3 (Cusack Park, Mullingar, 13/3/1955). MAYO: OR O’Neill; C O’Toole, P Prendergast, S Flanagan; G O’Keeffe, J McAndrew, E Moriarty; J Nallen (0-1), B McLoughlin; P Solan (1-0), D O’Neill, S O’Donnell; M Flanagan, T Langan (1-0), J Curran (0-2). SEMI-FINAL: Mayo 3-11 Leitrim 0-9 (Markievicz Park, 26/6/1955). MAYO: OR O’Neill; C O’Toole, P Prendergast, S Flanagan; G O’Keeffe, J McAndrew, E Moriarty; J Nallen, B McLoughlin; P Solan (0-2), D O’Neill (0-3), S O’Donnell (0-1); M Flanagan (0-1), T Langan (1-0), J Curran (2-4, two points from frees). Sub: J O’Grady for O’Keeffe. FINAL: Mayo 3-11 Roscommon 1-3 (Tuam Stadium, 17/7/1955). MAYO: OR O’Neill; W Casey, P Prendergast, S Flanagan; F Fleming, J McAndrew, E Moriarty; J Nallen (0-1), B McLoughlin; P Solan, T Langan (2-1), S O’Donnell (1-1); M Flanagan, D O’Neill (0-2), J Curran (0-6, four frees). SEMI-FINAL: Mayo 1-4 Dublin 0-7 (Croke Park, 21/8/1955). MAYO: OR O’Neill; W Casey, P Prendergast, S Flanagan; F Fleming, J McAndrew, E Moriarty; J Nallen, B McLoughlin; P Solan, P Irwin, S O’Donnell; M Flanagan (0-1), T Langan (1-1) , J Curran (0-2, frees) Subs: E Mongey for McLoughlin, M Mulderrig for M Flanagan, M Flanagan for O’Donnell. SEMI-FINAL (REPLAY): Dublin 1-8 Mayo 1-7 (Croke Park, 11/9/1955). MAYO: OR O’Neill; W Casey, P Prendergast, S Flanagan; F Fleming, J McAndrew, E Moriarty; J Nallen, E Mongey; P Solan, P Irwin, B McLoughlin; M Flanagan, T Langan, J Curran (1-7, four frees). Leitrim 1-3 Mayo 2-11 (Ballinamore, 23/10/1955). 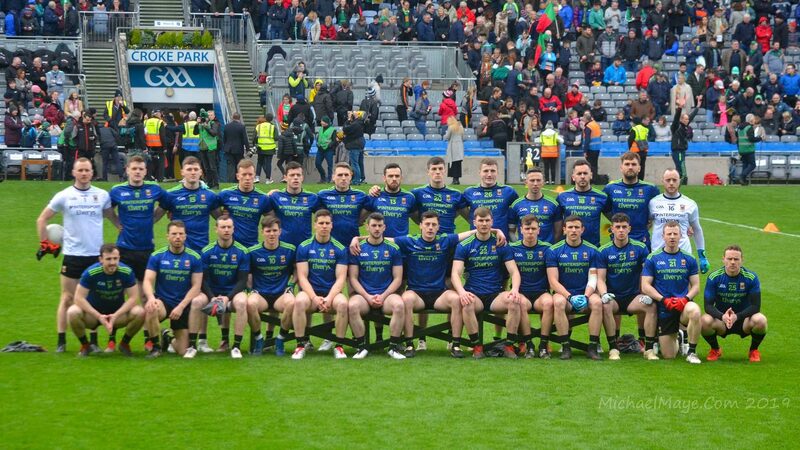 MAYO: OR O’Neill; G O’Keeffe, W Casey, S Flanagan; F Fleming, E Moriarty, P King; B McLoughlin, S O’Donnell; P Gannon (0-1), J McCormack (0-1), S Birrane; M Stewart (0-5), P Gavin (2-2), E Rowley (0-2). Mayo 3-11 Cavan 1-4 (MacHale Park, 6/11/1955). MAYO: OR O’Neill; W Casey, P Prendergast, S Flanagan; F Fleming, E Moriarty, G O’Keeffe; J Nallen, B McLoughlin (0-1); E Rowley (1-2), J McCormack (1-0), S O’Donnell; P Gannon (1-0), P Gavin, J Curran (0-8, five frees). Westmeath 1-5 Mayo 1-12 (Cusack Park, Mullingar, 20/11/1955). MAYO: OR O’Neill; W Casey, P Prendergast, S Flanagan; F Fleming (0-1, a free), G O’Keeffe E Moriarty; J Nallen P Gavin; M Stewart, B McLoughlin (0-1) E Rowley (0-1); P Timoney (0-2), P Solan (1-3), J Curran (0-4, frees). Mayo 0-7 Meath 2-6 (MacHale Park, 3/12/1955). Mayo: OR O’Neill; W Casey, P Prendergast, S Flanagan; F Fleming, J McAndrew, E Moriarty; J Nallen, P Gavin; S O’Donnell, B McLoughlin, E Rowley (0-1); P Timoney, P Solan (0-1), J Curran (0-5, 5 Frees). Subs: G O’Keeffe for Moriarty, D Keane for Timony. SEMI-FINAL: Mayo 3-4 Leitrim 1-3 (Markievicz Park, 26/6/1955). MAYO: M Nally; J Fallon, L McCaffrey, P Heaney; G Kelly, P McManamon, P Davey; M Kennedy, PJ Downey; P McDermott (0-1), F Fitzpatrick (2-1), P O’Toole; J Lowry, M Hunt (0-2), P Creighton (1-0). FINAL: Galway 1-5 Mayo 2-5 (Tuam Stadium, 17/7/1955). MAYO: M Nally; J Fallon, L McCaffrey, P Heaney; G Kelly, P McManamon (1-0, a free), A O’Reilly; M Kennedy (0-1), PJ Downey; P McDermott (0-1), J Lowry, P O’Toole (0-3); F Neilis, F Fitzgerald, P Creighton (1-0). Subs: M O’Boyle for Lowry, J Jennings for Kennedy. SEMI-FINAL: Tipperary 1-11 Mayo 1-2 (Limerick, 28/8/1955). MAYO: M Nally; J Fallon, L McCaffrey, P Heaney; G Kelly, P McManamon, A O’Reilly; M Kennedy, PJ Downey; P McDermott, J Lowry (1-1), P O’Toole (0-1); B Tuohy, F Fitzgerald, M O’Boyle.